Does your home have a swimming pool? Are you remodeling the community swimming pool? If you are planning to have a new pool deck installed, you should definitely familiarize yourself with all of the swimming pool deck options. 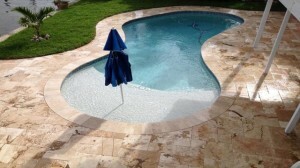 A popular pool deck option, especially in sunny South Florida, is travertine pavers. Travertine pavers may be the best choice for a beautiful, not slick when wet, not hot when sunny, not too difficult to maintain, swimming pool deck. Travertine does not get too hot, even in a warm climate and/or the sun shines down directly on the pool deck. Travertine is a kind of sedimentary stone so it has natural voids and openings in its surface which absorb the heat of the sun. It is very comfortable to walk over travertine pavers with your shoes off. Travertine does not get slick when wet which can easily prevent slip and fall accidents from happening. They have a tumbled surface meaning these are roughed up so the tiles won’t be slick for anyone walking on them. Unlike wood, travertine does not attract tiny insects and does not require a lot maintenance. Travertine is made of stone so they are durable and can last for a long time, which is why consumers often feel it is a good investment. There are also many choices available in terms of colors, styles and patterns. Travertine pavers can blend in very well with almost any landscaping. No two pavers will have the same colors and nuances which can make them look very attractive around the pool. Whether you are planning to build or to renovate your pool, consider contacting the experts at All Seal Exteriors to get a FREE estimate on a travertine pool deck for your swimming pool.